You all know that I participate in Menu Plan Monday. Even before I started blogging, I always planned out my meals for the week. By planning meals ahead of time, we end up saving money because we’re wasting less food. Food spoilage is like throwing money away! But doing a weekly meal plan involves more than just putting together a few recipes and calling it a day. If you want to eat fresh produce throughout the week and do it with only one trip to the grocery store, you need to know which fruits and veggies go bad quickly and which ones will last longer. Click here for a printable version of this list here. Below is the list I use to plan my meals each week. Right after you go grocery shopping, make meals with the fruits and vegetables that spoil most quickly. As you reach the end of your shopping cycle, make meals with cabbage, butternut squash, sweet potatoes, and other produce that lasts longer. 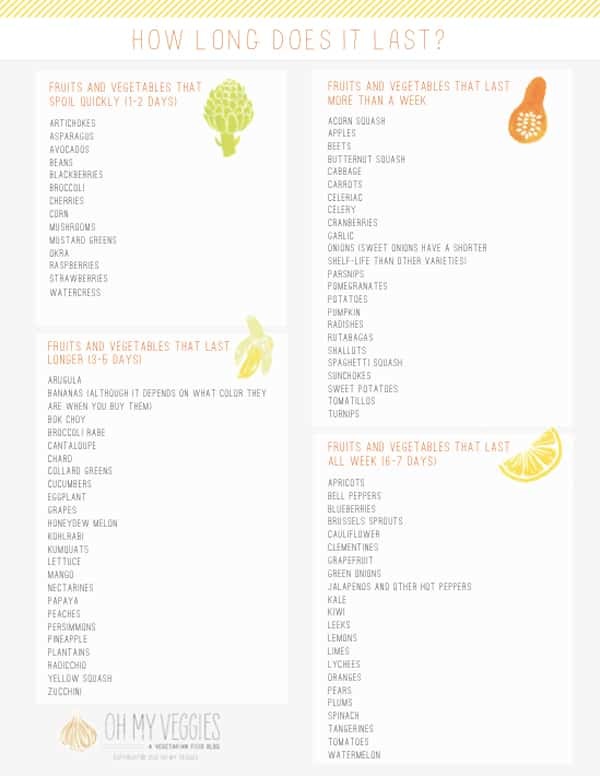 If you use this list and plan your meals accordingly, you can eat fresh produce all week long without having to go to the supermarket more than once. And, just a quick disclaimer: This list started as a small sidebar I cut from Vegetarian Times and over the years, I’ve added a lot to it and rearranged things based on my own experience, so your mileage may vary. Use common sense when you’re cooking–even if something is supposed to last a full week, if it doesn’t smell or look right, toss it! Awesome list! I used to be very diligent about meal planning; helped with grocery shopping, budget, everything. Sadly, it’s been lacking…My new CSA starts this week and I hope that helps things. This list is great! Thanks so much for sharing. I purchase my produce 2 – 3 times per week because I’m so worried about things spoiling. Hopefully this list will help me trim down my shopping trips. Great list! I really need to get back into meal planning. I used to take inventory of all the food in my cupboards, fridge and freezers and plan meals/shopping lists around them. I have been a total slacker about it for the last year though and have found that we’ve been wasting more food than I’m comfortable with lately! Thank you for all the tips – GREAT list! Great post! My husband and I always joke that some fruit come to our house to die a quick death. Now I don’t feel so bad 🙂 Happy Wednesday! Fruit is tricky–there aren’t many that will last a full week, except for citrus. I need to try one of those blue apple things and see if that helps! Great list! I try to buy the fruits and veggies that last only a couple of days when I know I’m going to eat/use them. I hate to waste food. I hate wasting too. A few years ago, I forgot that we had grapes in the fridge and I had to throw them away after they went bad and I still dwell on it to this day! Great list! I hate wasting food too and I often do unfortunately. Another food that I have to use within a day or two of buying it is cilantro, which I know is an herb but I buy it in the produce section and it just came to mind. Old cilantro is nasty! I was debating whether or not to include herbs! I think the ones that come from perennial plants (mint, sage, rosemary) last longer and the ones that come from annual plants (basil, cilantro, parsley) don’t last more than a few days. I hate buying cilantro because most recipes only call for a little bit and then you waste the rest. I got one of those herb keepers where it keeps the stems in water & that helps a lot. Thank you, this is really helpful!! Love this list. I am trying to play catch up today…getting a week behind is the pits. All of my stuff would have spoiled if I would have had any! I am behind on everything right now too. The plan was to catch up today but it’s already 6:30 and I haven’t accomplished much! I love, love, LOVE this list! I’m notorious for keeping things longer than I should, but I feel horrible throwing food away! But if you plan in advance, you won’t have to throw things away! That’s why I do it this way, because I really can’t stand to waste food. My mom used to always tell me & my brothers that wasters go to hell and it’s completely warped my psyche. Thanks for this list. Its very helpful. With certain things, I didn’t know how long they would last exactly and this will help a lot with preventing food waste.